Duplo's 150 Digital Booklet System is the combination of the worlds smallest fully automatic booklet maker, the DBM-150 with the new generation DSF-2200 sheet feeder. It is an ideal near-line solution for low to mid volume digitally printed sheets. This System is configured to meet the ever changing demands of today's digital printer and is designed to take printed output from multiple sources. 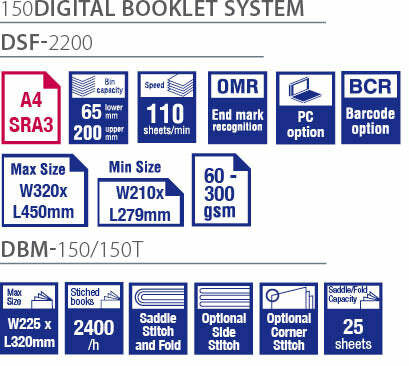 Duplo has bundled the features of the big booklet makers into this uniquely compact system. The 150 Digital System is an extremely compact, modular system combining sheet feeder, bookletmaker and trimmer. It provides features such as job integrity (for confidence that production is correct), fast operation and two feed trays (to allow the merging of differently finished stocks). Being a modular system, Duplo has a range of alternative feeding and finishing devices that provide the business owner with the opportunity to upgrade or change devices as needs change and business develops. The 150 Digital System is operated from a user friendly PC controller, allowing easy recall and setup of jobs with many key features having automatic set-up. The system can finish up to 2400 books per hour without operator intervention or any wastage. Moreover the feed trays on the DSF-2200 can be utilised in five different ways for optimum efficiency.